Despondency may descend upon the artist who assesses a completed still life for the first time only to be met with garish flowers, wonky ellipses, insipid colours or a foreshortened object that appears skewed. The rendering may have a naïve quality or one where the problem is difficult to identify; the painting just looks wrong. Such dissatisfaction may cause the artist to throw in the brushes, but such a decision might be hasty. Executing the painting whilst sitting close to the canvas will cause imperfections and errors to become invisible until viewed from afar. Tumblers that lean to one side or a biscuit tin that lacks a vanishing point will remain undetected until it is too late. Sitting too close may also result in a squashed-up rendering of a still life that inhabits one corner of the page. Failing to make visual comparisons between the painting and the still life setting means the memory must fill in the gaps. Painting from memory will undoubtedly ruin any attempt at realism and lead the artist to make assumptions about the objects in front, such as: all oranges are perfectly round and all teapot spouts are long in shape. This dogmatic advice comes from what I call the dictatorial part of the brain, and is the enemy of authentic art. Similarly, a still life containing a long object viewed in foreshortening such as teapot spout or a breadstick often creates a dilemma; the object is long, and yet it looks like a stub. In a bid to make the two marry-up, the artist may artificially lengthen the object in the sketch even though it appears a mere stub in real life. Painting onto a white surface will make it difficult for the artist to make accurate judgments of the objects’ tonal value. A pale colour when applied onto a bright white canvas will appear dark, even though it is pale. This will have a culminative effect upon the painting where a wishy-washy oil sketch may result. 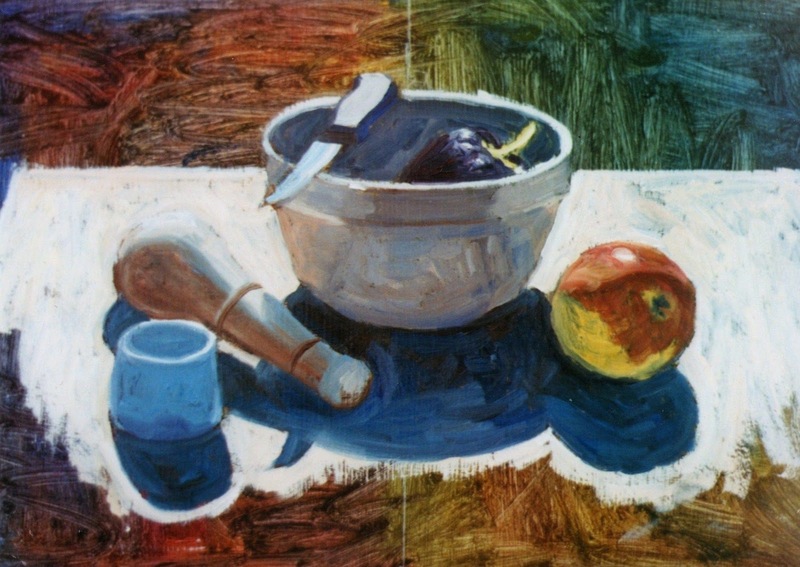 Not planning the drawing and compositional stage of the painting could lead to a still life that lacks balance. A shadow falling off the edge of the painting or too many large objects in one corner could lead to a lopsided painting for which no painting technique can compensate. Making improvements to a childish style of painting is possible by simple strategies that will require practice. Plan the composition before laying paint to canvas. Identify the centre-point of the setting to ensure the objects sit squarely on the page. Guard against drawing too small. Keep marks loose and bold. The first mark is rarely correct so making a preliminary light sketch will make it easier for the artist to lay down darker lines where adjustments are needed, although an eraser can be used. Apply a thin wash of neutral-coloured acrylic paint before embarking upon the still life. Such an under-glaze will give a truer indication of the colours’ tonal values as opposed to painting onto a white surface. Endeavour to use an array of tonal values from very dark to very pale to prevent an insipid painting that is hard to discern from a distance. Make the regular habit of getting up and viewing the painting from afar. This enables the artist to make visual comparisons easier, as both the still life setting and painting can be seen on a smaller scale. Turn the painting upside down or view through a mirror. Doing so will reveal hidden mistakes or if the painting is lopsided. Make adjustments whilst the painting is upside down. Remember to keep making visual comparisons. Do not let memory sneak in. Break down the composition into a simplified jigsaw. Make comparisons between how one object looks against another regarding tone and contour. Is the milk jug twice as tall as the teapot or slightly taller? Is the eggcup slightly darker than the egg or slightly paler? The first mark will seldom be right but making adjustments whilst the painting is in progress is the key to edging towards accuracy. Believe what the eye sees regardless of how “wrong” it might seem. This applies particularly to foreshortening. A long object can indeed appear short. Forget what the mind knows about the object and override presumptions about how the objects “should” look. Begin with a simple still life rather one that is too challenging. Ellipses, like foreshortening and reflections often create problems for the beginner. Leave them until more confident with still life painting. These issues are tackled in separate articles. Don’t give up too easily if a still life rendering looks childish. Simple painting exercises can be tried to overcome garish flowers or a lopsided drawing. Plan the composition before laying down the paint. This means centering the objects onto the painting surface and not drawing too small. Ensure any perpendicular contours are indeed perpendicular and not leaning to one side. Get up and view the painting from afar; view it through a reflection or upside down. This will reveal hidden mistakes. Apply a neutral under-glaze to kill the whiteness of the painting surface. This will make it easier for the artist to judge tonal values more accurately. And finally, simply paint what the eye sees, not what is imagined. A banana can appear ovoid; a violin can appear rectangular.